Yesterday evening Nantko and I celebrated our birthday at Mulligans. Nantko's is today: happy birthday! ), mine is next Tuesday. Kees took pictures. 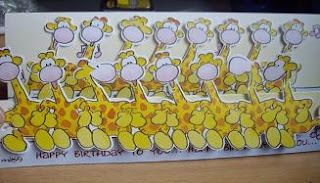 Here are the giraffes on the birthdaycard Babs (my collegue) gave me up close. They also had 10 euro's with them for me. Danny gave me something I fell in love with long time ago. 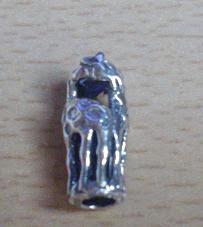 It's a trollbead and yes these are giraffes. The other side has another giraffe. I don't have a bracelet fot the bead yet, but tomorrow is my day off. Guess where I'll be in the afternoon? :D Miriam gave me a Mulligans T-shirt as you can see in kees' pictures. When I left Mulligans around 2:00 A.M. I think, maybe later it was raining cats and dogs. I cycled as fast as I could to get home, but I was drenched anyway. This morning I was up bright and... uhm ok not so bright but very early. 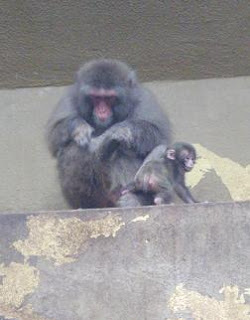 I gave a guided tour at the zoo. After the tour I called one of the zookeepers to ask if he had some camelhair for me, and he had. 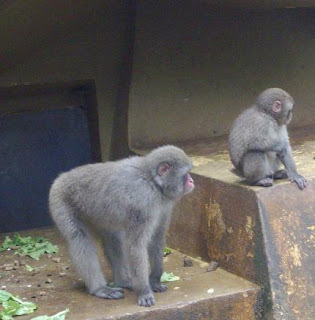 He would sent another zookeeper to me and I had to wait for about 15 minutes. So I was walking in the neighbourhood of the camel stables and saw some very nice young animals. 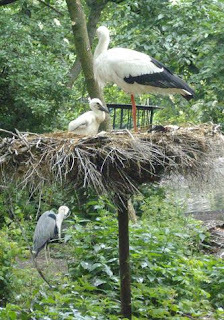 Thers's another baby stork in the nest, but it's lying flat so you can only see it when it pops up his/her head. When I got home around 3:00 P.M. I went to bed for a little nap. Tonight I'm living my Second Life. Gepost door Marion op 6/01/2008 07:57:00 p.m. Happy belated birthday from Renate and Torsten! Leuk die bedel !!!! Toen ik in april bij je logeerde zag ik jouw bedelarmbandje, en bedacht me ineens dat ik er ook eentje heb. Die draag ik sindsdien weer, jouw schuld :-D Mijn bedelarmbandje is al heel oud: het was een kettinkje dat ik kreeg voor mijn 10e verjaardag, met 7 bedels eraan: van ouders, opa en oma's, enz. 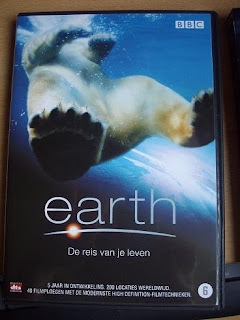 Als tiener heb ik er een stuk af laten halen, zodat het een armbandje werd. @Neuzel: hey bedankt voor je vraag. ik heb de typefout meten verbeterd!